The story is (very loosely!) 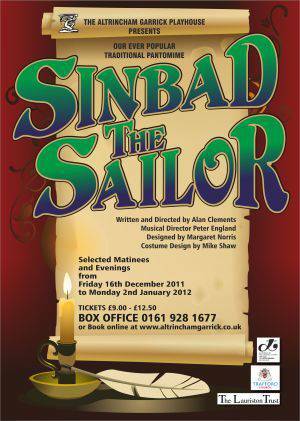 based on the Arabian Nights stories, and The Seven Voyages of Sinbad. Sinbad sets off on a hazardous journey to the mysterious island of Colossus. His quest is to break the spell cast over his beloved princess by an evil sinister magician. But before he can save her, Sinbad must encounter an array of mythical obstacles and creatures that stand in his way. A band of cut throat pirates, a shipwreck, sabre-wielding skeletons, a fire breathing dragon, the Giant Roc bird and much more. But with the help of his loyal crew, his well meaning brother, and his doting mother, he will make his fortune, save the Princess, be given half The Caliphs kingdom, and live happily ever after. Of course he is, it’s Panto Time! PANTOMIME isn't my favourite form of theatre but I have to give credit where credit's due and Altrincham Garrick's seasonal offering,Sinbad The Sailor, is funny, perfectly paced and just the right length to prevent an outbreak of fidgeting among the little ones. It's a difficult task to single out individual performances as there aren't any bad ones and this production is the perfect advertisement for the Garrick's youth theatre. The youngest members of the cast looked impressively self-assured, without that air of precociousness that gets up my nose. Whenever I hear?Peter England?is involved in a show I always sit up and take notice as he has this gift of getting the best out of a cast vocally and this production is no exception. Thanks to his skills as musical director, the company sounds magnificent, delivering every song with enthusiasm and panache. If I have a criticism it's that some of the jokes are milked far too much, but everything else is flawless. Mike Shaw? (The Great Mysterioso) really reminded me of the villainous Professor Snape from the Harry Potter movies,?Grace Garside?is a likeable Princess Sharizar and?Adam Gonet, born to be in panto, had the children in the audience hanging on his every word as the lovable Ali Bonkers. ?Natalie Hinchcliffe?is a charismatic Sinbad and?Sean Gonet?and?Dave Jones?are perfect as the daft as a brush duo, Hubble and Bubble.